This is the most popular safari and it is available all year round. Arrival is on a Saturday at lunchtime and after a safety briefing your first safari ride begins. You stay in base camp three nights and explore the surroundings. On the fourth day, you ride to Beacon Rock and sleep under the stars. In the morning, you ride to the next beautiful camp where you stay for two nights. You then have a long ride back to base camp and one last night together. This ride is shortened at certain times to 5 nights when you will not ride to the camp at Makhutswe River, but rather you will you ride back to base camp after a night under the stars. This is an example of the weekly program. It may change due to local circumstances. 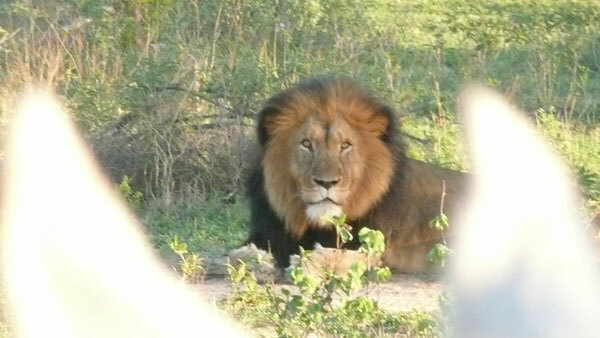 No two weeks are the same with wild animals moving about in the large reserve. Some weeks you can get to see lots of giraffe while another week you may only see a few. If you have ordered a transfer, you will be picked up at the airport and driven to the camp. Your guide and the safari’s owner, Philip, will welcome you. After a review of safety rules and something light to eat you embark on your first safari ride. You might see your first giraffe or zebra. The sunset over the Drakensberg Mountains is the perfect backdrop to the generous three-course dinner with carefully selected South African wines that will be served in the dining area. The accommodation for the first three nights is comfortable safari tents with showers and toilets, built on a platform over the Makhutswe River. You will be woken by the smell of freshly brewed coffee and tea. After a light continental breakfast you continue your hunt for wild animals. The weather determines how the day will go, if it is cool you can be out all day and ride to a large pond where crocodiles can be seen. Even eagles and hippos like this area. For lunch, you will enjoy the picnic you have brought with you under the shade of a tree. Then, you continue to follow the wild animal tracks. Suddenly, Philip stops as he sees traces of a cheetah. He immediately follows to ensure you get a chance to see these beautiful felines, the world’s fastest land-animal. If you are lucky, you can see them hunt or perhaps find them relaxing in the grass. What an awesome animal and a great wildlife experience! While you listen to the sound of a roaring cheetah during the night, Philip is finding its tracks along the river's edge and you ride off in the morning to see this impressive cat. When you find it, there is an almost spiritual silence as you witness this animal in complete freedom. Lunch is served on the terrace at base camp: fresh salad, pizza, quiche, cheese and cold cuts. After a siesta, you wake to the fragrant smell of a homemade cake. You can relax by the pool. Then you head off with the jeep and visit an interesting buffalo project where you have the opportunity to study and learn more about this impressive animal. Philip follows the tracks of animals he finds. If it is traces an elephant, it usually leads to the Kufunyame River, where large trees and high river grass provide good elephant food. In the afternoon, you pack up your things and load the bags into the support car to take them to the next camp. You go there on horseback. The ride heads south and you pass the twin Lion and Leopard rocks. The soft paths offer great opportunities for long gallops. Giraffes, zebras or wild boar might be keen to join in. Sometimes, Philip stops suddenly and jumps off his horse to examine the ground, he might have found traces of rhino and you take the chance to track them, of course. Beacon Rock Camp is located high on a cliff overlooking the Low Veld. If you climb up to the top, you get a great view of the area. You set up camp under the stars with a lovely fire to warm you. It is very exciting to lie there at night and listen to the sounds of wild dogs, hyenas and jackal. You wake up at sunrise and light the fire to get a refreshing cup of coffee. Then it's time for the longest ride of the safari. You ride into Makalali Reserve, which is dominated by vast open plains where you can suddenly find yourself galloping side by side with giraffes, zebras and wild boar. Spectacular views over great distances show the way to XiDulu, your camp for the next two nights. XiDulu is built at the edge of a pond where hippos live. You can experience the wildlife from the deck of your cabin or a viewing platform or, even better, while enjoying a dip in the pool. The rooms are all equipped with showers, baths, air conditioning and a large veranda. Elephants often come here for a swim during the day, while at night lions and hyenas can often be seen or heard near the camp. Today you ride off to explore the surrounding area, sometimes at a gallop and sometimes riding through the jungle-like vegetation, which Philip calls "bushwhacking". You never know what you will find. Changing direction suddenly when you see something interesting, you might jump over a fallen tree that has been felled by an elephant. The horses find it as much fun as you do. Up on a high cliff, you see mile after mile of South Africa's unspoiled scenery laid out before you, ready to be explored. After the afternoon siesta, you have the opportunity to accompany Patson on a game drive or take a ride in the surrounding area. A long day's ride ahead of you. You never know what animals you will encounter. The area has lion, elephant, rhino and giraffe. Philip follows the tracks he finds, so there may be many detours before you arrive "home" again. Gerti serves a special farewell dinner that may include delicious meats served with fresh pasta and sherry sauce, which is obviously served with good South African wines. You wake up early to catch one last ride so that you leave with high-paced memories of this amazing safari. A minimum of 3 and a maximum of seven riders.